Two students of Covington Catholic High School in Kentucky, Sam and Grant, made a video statement recently detailing some of the aftermath their school is dealing with after the media featured a short video of a group of students and Native American activist, Nathan Phillips. The short video of the incident that initially went viral showed student Nick Sandmann “smirking” at Phillips and many in the media reported that the kids were harassing him. However, a longer video revealed that Phillips first approached the boys and began playing a drum in Sandmann’s face. In a statement, the boy said he was confused by Phillips’s approach and was not meaning to “smirk” or appear disrespectful. He argued that the group of boys had simply done some school spirit chants after another group, the Black Hebrew Israelites, yelled slurs at them. He claimed that they were not antagonizing the activists. “Several media platforms blatantly lied about the events regarding the controversy in D.C. and it has affected us as a community and individuals greatly,” Grant said of the Covington School community in the video responding to the incident. "There have been many threats against our lives, against our parents," Sam said. "Some of these threats include that we should all be locked in the school and it should be burned to the ground, the school being bombed, school shooting threats." “A lot of the negativity and the hate surrounding this event comes from people on social media, doxxing people that were at the event,” Grant said. The students are struggling with the aftermath of being doxxed - having their personal information publicized online with malicious intent. Sam said he was also doxxed. 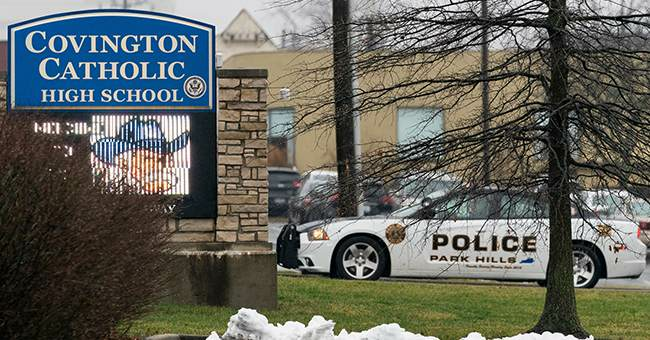 Covington Catholic school was closed Tuesday due to safety concerns as the school continued to receive threats. President Trump defended the students on Twitter Tuesday morning.